Dimensions: track is oval, with diameter. than 28 cm and 24.5 cm small, 4 cm thick - I mean and relief. A large piece! 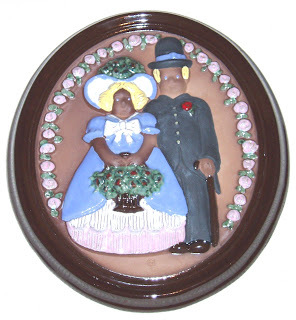 An unusual piece, both in size (very large) and by size (depth, perspective) bas-relief painted and partially glazed. 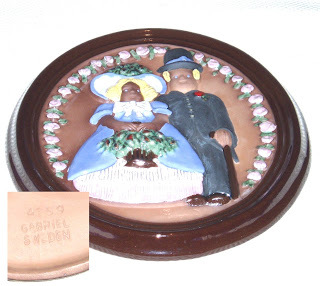 Finally, a wall plate (wall plaque - as it is called) accomplished ceramist artisanal Inge-Gerdh (Ingegard) Burmeister - wife or daughter of "GABRIEL Verken" brand founder, that Gabriel Burmeister (1886-1946), famous Swedish artist ceramist. 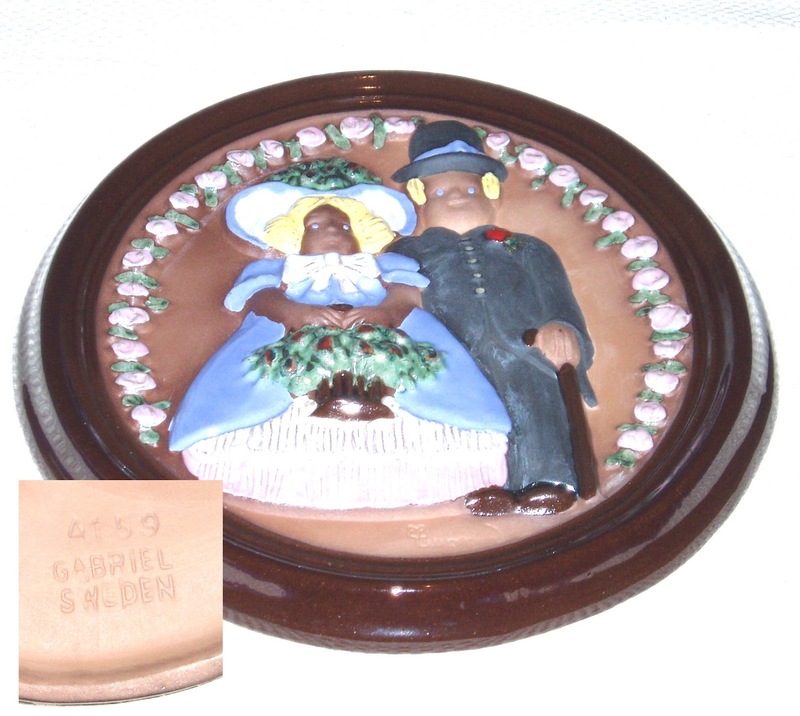 We use the term picture, unusual for ceramic pieces, because Ingegard, who signed on the front, even within relief with the bride and groom in an early-twentieth-century dress, colorful and email, to a variable frame oval, enameled with a dark brown, suggesting a wood picture frames and idea. The idea that an artist is that picture suggests votive, found on the walls of living rooms - until recently, with the bride and groom. Is a painting technique deliberately "naive" - she is standing thus in a position slightly ironic-nostalgic and sweet at the same time, to what parents might even photography, capturing fine that stiffly position, tense, to the photographer, all grooms. They just these subtleties of painting make it a true work of art, beyond the already established name of artist Inge-Gerdh Burmeister! About price, what can I say? The piece is an authentic, identified, signed, hand-made. It is unique, only that it is very rare (considering its age, 50-60 years) and is not for sale. I think I set a modest price, right.